during this 1-Day Class with League-juried artist, Susanna Ries. This high paced class will have you cutting, copper foiling, soldering and framing a stained glass panel in one day. You can choose your own design from patterns supplied by the instructor or you can use one from another source as long as it is constructed of 13 glass pieces or less. The basic skills of stained glass construction will be taught and you will go home with a finished piece that is ready to hang! Students will need to bring: cork board at least 16 x 24 inches, apron, scissors, latex gloves, safety glasses (if you wear glasses you do not need safety glasses), very casual clothes and covered shoes – no sandals! And of course, a large plastic sealed bag or grocery bag to carry your piece and pattern home. Tuition is $48.00 per student and there is a $40 materials fee, paid to the instructor on the day of class. Beginners and advanced students, age 12 and up, are welcome to participate. 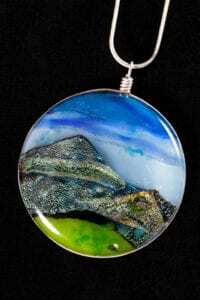 Learn to make your own Dichroic Glass Pendants at the Meredith Fine Craft Gallery with League-juried artist, Lynn Haust. Come and find out why melting glass is so fun and addictive in this fast paced class that will give you a chance to explore kiln fired glass and many of the techniques that make melting glass so exciting! In this 2-day class, you will be using Bullseye glass to create several glass pendants. Day 1: Students will be using clear and black dichroic glass as a base and then layering colored dichroic glass over to create sparkle and depth. We will cut and assemble 2 pieces of glass that will be full fused into large squares. Day 2: In the second class, students will cut and shape your full fused glass into pendants, using a variety of cold working techniques. You will gain cold working experience by using different equipment to achieve the desired pendant shapes. The cold working equipment includes: Grinder, flat lap grinder, glass band saw and drill press. Before firing a second time to fire polish your work, we will add fine silver to create a way to hang your pendant. Your pendants will be fired and annealed off-site and you will be notified when they are available for pick up within a few days after the class. Tuition is $120.00 per student and includes all glass materials and several silver chains. Come and find out why melting glass is so fun and addictive as you explore the medium of kiln fired glass. Learn many of the techniques that make melting glass so exciting with League-juried artist, Lynn Haust. In this 2-hour class, you will be creating your own glass suncatcher to keep or give as a gift. There will be an assortment of Bullseye Glass to choose from. You will learn how to combine the glass to create rich colors and textures that will reflect and transmit color and light. 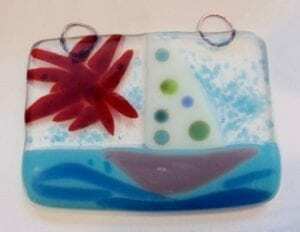 Your suncatcher will be fired and annealed off-site and you will be notified when it is available for pick up within a few days after the class. Tuition is $40.00 per student and includes use of tools and choice of glass materials in various colors. Explore the world of melted glass in a fast-paced workshop that will introduce the glass student to the techniques, materials, and equipment used to create a beautiful glass landscape with League-juried artist, Lynn Haust. Create an original work using a full range of glass colors in sheet, various sizes of frit, strangers, and a variety of kiln techniques to create depth in your image. 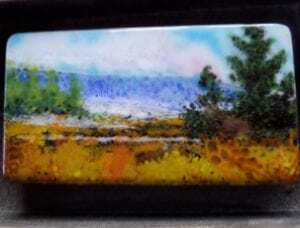 Many fused glass landscape examples will be on display. Safety, kiln firing, glass cutting, and cold working techniques will be covered. An information packet will also be included. We will be using Bullseye glass COE 90 and other equipment to cut, grind, and shape your glass. Come prepared to work hard and have fun! Tuition is $140.00 per person.